2010 Indian Premier League - IPL3 Royal Challengers Bangalore beat Rajasthan Royals 49th Matches win 5 wickets with 26 balls remaining, Wednesday, 14th April, 2010, at Jaipur. RR 130/6 in 20 overs while RCB made 132/5 in 15.4 overs. man of the Match is Kevin Pietersen who made 62 runs. Rajasthan Royals Things went wrong right from the start when Michael Lumb was run out trying to steal a single to backward point. The new batsman Amit Paunikar fell for a first-ball duck, edging an attempted hook to the keeper. The worst shot from a top-order batsman, though, was from Naman Ojha who heaved a back-of-length delivery from outside off to mid-on. In a blink, Rajasthan had slipped to 21 for 3 in 3.2 overs and though Shane Watson attempted a repair job, there was never a phase of play where Rajasthan dominated. 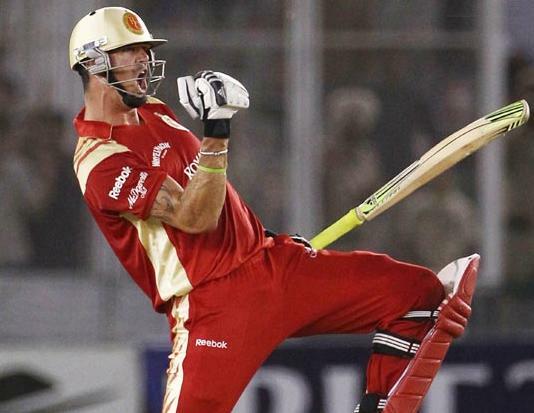 Royal Challengers Bangalore with Kevin Pietersen taking complete control of the innings with an entertaining and aggressive knock. He looted 18 runs in the fourth over, bowled by Kamran Khan, with the help of four boundaries - a slapped four, a muscled hit over mid-off, a scorching off-drive and a pulled six. When he collected three more boundaries in the sixth, bowled by Adam Voges, Bangalore were comfortably on course. Toss - Rajasthan Royals, who chose to bat.